This is a mish-mash post of this and that; a post that is more more Chatty Cathy than usual. Life has been different lately and has gotten much busier - as I knew would happen - once we started up the new school year. I knew changes were a foot but that doesn't mean that adjusting to them is easier just because I knew that they were coming! Mostly it seems like the day is full of schoolwork, general housekeeping and projects. It's a good life and a full one but I'm running out of time! I'm sure that at least a few of you are smirking, if not simply smiling. I'm still sorting out all of the emotions and priorities which need to be a part of life now. I don't mean to make it sound completely unenjoyable because that would be a misrepresentation. It's just new. Different. And that requires an adjustment. I don't resent it one little bit. I'm just trying to find my new bearings. It's just in figuring out that there is only so much energy to make it through a day and trying to figure out what needs the most energy in any given moment so that we can proceed. School is going well and the kids and I are both enjoying (the majority of) it. There are a few subjects that cause us to groan but working on projects all together, regardless of age, I've found to be a peacekeeping method to getting through the work. It's nice to work at the same pace (except when it isn't) and be learning about the same things at the same time (albeit perhaps at different grade levels). Our current favorite subjects are science and history. Our least favorite is spelling. This is pretty much a collective feeling. In fact, we have a contest running right now through our Facebook page wherein some lucky child can win $25 in store credit from our store. If you've got kids that like to play with LEGOs and want to try to win some for free, check out our FB page for more details. Next week is November and I can hardly believe but that it's time to start focusing on holiday prep and gatherings. Aside from LEGOs and schoolwork we're thinking about finishing up some Christmas shopping (yes, almost done) and finishing some projects related to that. We'll also be up to our eyeballs in pumpkins soon, as its time to begin roasting fresh pumpkins and making yummy soups! Time to pull out my favorite Pumpkin cookbook and play around some more. You know . . . in all that spare time! Lastly, but first, we've been busy with our church and various ministry opportunities. 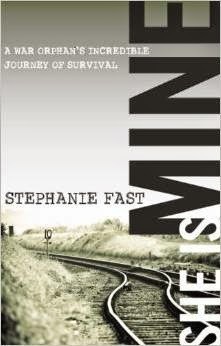 We had the extreme pleasure of hosting Stephanie Fast for an evening just a few weeks ago. You might recall that she wrote the book She is Mine (which I still think you just MUST read if you haven't!!!). I've linked the title to my review and would encourage you to check it out if you skipped it previously. At any rate, the recording of the evening event is online through our church's website. If you need some spiritual encouragement these days - and/or want to know the love of God - then I highly recommend giving her talk a listen. Her message contained such rich, Biblical truths and was deeply impacting to a number of us. Next week on the blog is not going to be so much about book reviews but giveaways. I've got a little line up with some fun stuff planned because sometimes it just needs to be about the fun. Hope you'll enjoy it. In the meantime, plan for Sky to wrap-up the discussion of The Hound of the Baskervilles tomorrow as we (unbelievably!) bring October to a close! Yikes!! We only homeschooled for a few years, but I do remember it taking up the great majority of time when we did. If I had it to do over again, I would teach the same subjects to all of them at the same time, too. At the time I was too afraid to veer much away from what the teacher's manual laid out. A friend who homeschooled all her kids all the way through described it as letting each one "off the bus" at different parts of the subject. The littlest one might be released to color a picture nearby after a short time, while everyone else continued on, then the next youngest could do a project and work on something else, but the eldest would be kept a little longer, because he'd be able to take in more. That would really help in a lot of areas, like capitalization, where each year you added on to what they had learned before. How neat to hear Stephanie Fast in person! Girl, I do indeed understand! I hardly even have time to READ blogposts these days, let alone write them! (But I do make time for reading books, wink) I need to have an hour long conversation with you, but I never seem to have that block of time to email. I might start sending you just a few sentences at a time and then you can string them all together yourself! ha! But I love the LEGO store idea, and hope to listen to the Fast recording sometime as I'm working in the kitchen. Hugs to you!